David Lunde describes his new book as a collection of prose poems and flash fictions which explore the oddness and unpredictability of our lives and minds. A few pieces are based on overheard conversations, slightly edited, that seemed to expose the characters’ being and future. 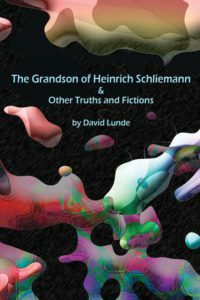 Some pieces are based on actual people and events, such as the title piece, “The Grandson of Heinrich Schliemann” which presents a person, who, because his grandfather had found the fabled city of Troy after other archaeologists had concluded it was imaginary, now believes that anything he thinks is true will be true. Many pieces are purely imaginary but are based on quirks, obsessions and longings Lunde has observed in myself and others. Tasty morsels, that’s how I think of these short pieces Lunde proffers, and he serves them up in style. Each is just exquisite, the sort of prose that often is a total poem, the way a masterpiece of art sums up an idea or emotion perfectly. For instance, “Symbionts” tells of a night blooming plant luring a moth to its bidding so that by morning, it has the gift of flight. A dash of Charles Simic, a touch of Tom Wiloch, and for me, perhaps a taste of Emily Dickison—whether you agree or not, you?ll find this collection is absolutely enchanting. — Marge Simon, Bram Stoker winner, VECTORS: A Week in the Death of a Planet, 2007. Why is that man so bald, Father? He probably has a son, my son. When a man has a son, it is his duty to worry. But why does that make him bald? A man’s hairs stand about on his head like children squinching their toes in soft spring mud. But when the head becomes worried, its scalp contracts, pinching the delicate feet of the hairs. Ow, ow, say the hairs, and they run off to the heads of the young and carefree. But Father, you have a son, and you still have hair. Don’t you care about me? The father removes his toupee. Of course I care, my son. Father, why have you hidden your love? David E. Lunde is Emeritus Professor of English, SUNY. He is a graduate of Knox College and the University of Iowa Writer’s Workshop, where he was awarded the Old Gold Fellowship in writing and the Academy of American Poets Prize. He is a member of the American Literary Translators Association, Science Fiction Writers of America and the Science Fiction Poetry Association. He is the winner of two Rhysling Awards for Best Science Fiction Poem of the Year. The Carving of Insects, the collected poems of Bian Zhilin, which he co-translated from Chinese with Mary M.Y. Fung, won the PEN USA Translation Award. He has published eight books of his own poetry as well as Breaking the Willow, a collection of his favorite Chinese translations, and 300 Tang Poems which he co-translated with Geoffrey Waters and Michael Farman. A Full Load of Moonlight, a collection of Chinese Chan Buddhist poetry co-translated with Mary M.Y. Fung, will be published at virtually the same time as The Grandson of Heinrich Schliemann & Other Truths and Fictions, in Spring 2014. Approximately 1000 of his poems, stories, articles, and translations have appeared in more than 250 periodicals and 40 anthologies.